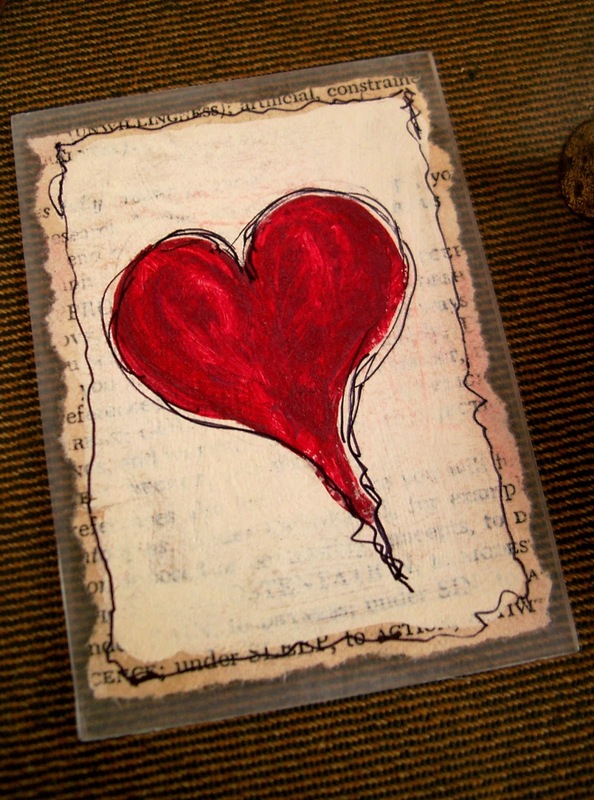 :: Valentine Artist Trading Cards :: Yes, your Valentine Day Cards just got a size smaller. A craft that’s close to my heart: artist trading cards. They are so creatively satisfying, and perfect for Valentine Day Cards. This is the kind of craft that I actually do myself. I have tons of books on making art pages / artist cards and can show you lots of examples on what make an artist trading card work. Most importantly, they need to be artistic and soulful. And that, ladies and gentlemen, is something that can be said of today’s feature: Linda’s artist trading cards are soulful. And beautiful too. So, I’m showing you hers! 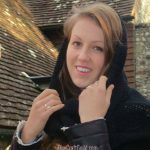 Before we get to the details of this wonderful feature, let me take a minute to introduce this week’s linky party. Thank you all for sharing your amazing contributions, week after week. 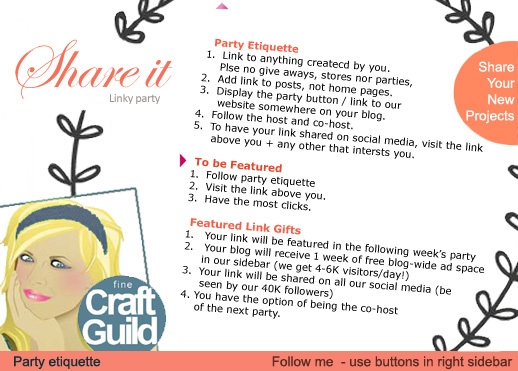 Our party etiquette gives loaded of giveaways and freebies for you, but also asks you to be a somewhat active participant. By those who make them, artist trading cards called ‘ATC’. they are often made with mixed-media, although they can be painted, scrapbooked, drawn, or sewn as well. I was living in California about a decade ago when they became the rage amongst artists who were involved in mail art. It was kind of a counter-culture to the rising popularity of digital art, but also enriching digital art. In fact, at that time, I was taking digital art courses and we made some artist trading cards in class. What is just so nice about making artist trading cards is that you can bring your project along wherever you go. It’s small. In fact, it’s tiny. What is the size of artist trading cards? Well, the same size as football trading cards: 2.5 by 3.5 inches. That’s about 6.5 by 9 cm. What I particularly love about Linda’s article is how she explains that artist trading cards can have many purposes besides being traded amongst artists. One of her novel ideas is to use them as portable mood boards for decorating projects. Linda’s work is excellent. I feel so inspired by it. And she is a girl after my own heart: she uses recycled and found materials rather than craft-store supplies. I like to mix them up, and love the artistic results you’ll get when you constrain yourself on your craft store jewels, and you go lavish on adding artist finds. It’s about balancing wild vs. polished. 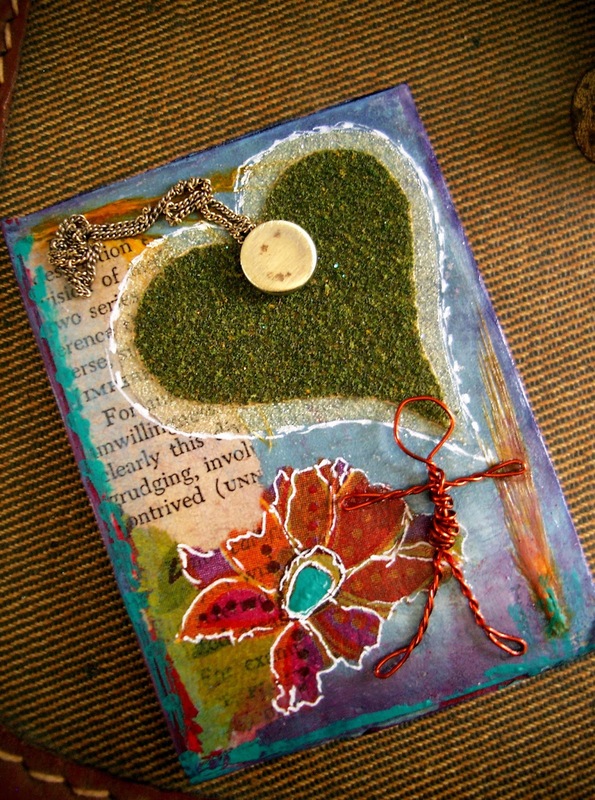 I am adding this lovely green heart image because to me it’s so LINDA! See, she does not ‘advertise’ it but Linda designs gardens (be sure to check out a few of her garden design posts) and so to me, this green represents her love of nature, purity and a freshness of spirit. Healthy. It’s my favorite of all the cards she is showing. There are many more photos in Linda’s post. So, go visit Linda’s blog for her gorgeous artist trading card designs. While there, browse around at Linda’s blog also as she has quite a few artistic small weekend art projects. Thanks so much for hosting@!! I love the Valentine Trading Cards! What a clever idea, and I like the results. Thanks for hosting. Linda’s work is really awesome! I also have little containers to keep every little thing I found on my way. Thank you for hosting sharing all of the amazing links. 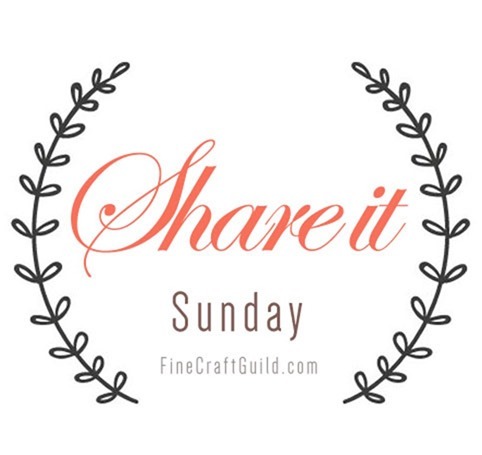 I would love it if you would stop by the Homemade and Handcrafted Party to share your own posts with us! Have a wonderful week! 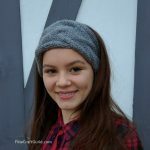 Thanks for hosting this fun and crafty link-up party every week!